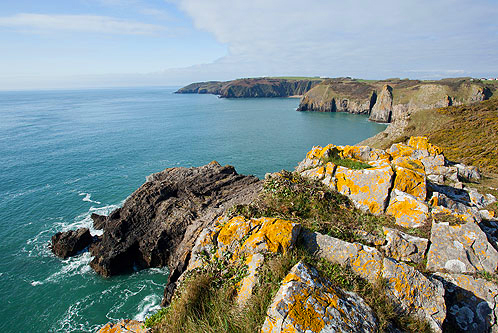 View from the west of Lydstep Headland , passed Lydstep Caverns Beach and Skrinkle Haven to Old Castle Head ( with a Military base on top ). The rough looking headland "Black Mixen" ( bottom left of this photo ) is covered with angular Limestone Fragments , cemented together and overlying a cemented ancient glacial deposit. These materials have accumulated during the ice Age.